Things I noticed before lunch time today! When it’s raining, the dogs all walk in different directions when they come in with wet paws, the better to spread as much mud around the floor as possible. A little wren was having a wonderful shower as she scurried in and out of the wallflowers. She was almost wriggling with delight. (see the poem this inspired at https://sallyjblackmore.co.uk/triolet/the-wren). It is always better to have my specs on when I am vacuuming the carpet and cleaning the bathroom. I am short-sighted and I thought I had done a good job until I looked at it with my glasses on my nose. Conversely, it is much better to take my specs off when I trudge into the garden with the dogs when it is drizzling, or very soon I am peering through and around spots and blobs on the lenses. One of the most enjoyable things is to be dressed in comfy ‘house’ trousers and to curl up with various dogs on and around me, sip a cup of coffee and watch the rain dappling the windows. Three very fat pigeons, crouched beneath the shrub next to one of the bird tables look for all the world like gossiping goodwives at a church meeting. It takes half an hour for the Jack Russells, all three of them white and moulting ferociously, to find the newly hoovered rug and then roll on it until it once again sports a light, all-over, furry covering. The peace lily that I moved into direct daylight a short while ago already has new leaves appearing. 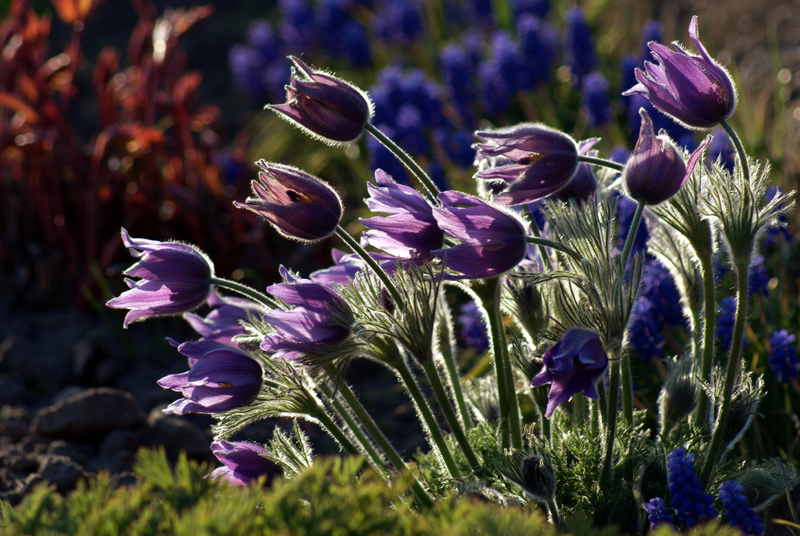 The Pasque flowers in the garden have sprung into bloom overnight…it must be the rain that has encouraged them. It’s high time I took the red chilli (Christmas) wreath down in the hallway and replaced it with something more seasonal! How much more I notice when I am trying to take note of what is happening around me. Sitting still, with no sound to be heard other than the gentle snores of sleeping dogs makes it very easy to doze and daydream the day away. Shake a leg – it’s time for lunch or the whole day will escape while I sit here pondering. This entry was posted in birds, dogs, poetry, Spring, Uncategorized, wildlife, writer, writing and tagged birds, dogs, Flora and Fauna, garden, Passeriformes, poetry. writer, Rain. Bookmark the permalink.